Pt is a 53 year old male with a 25 pack-year hx of smoking (quit in August of 2001), a distant Hx of methamphetamine and cocaine addiction, and is an occasional alcohol drinker. 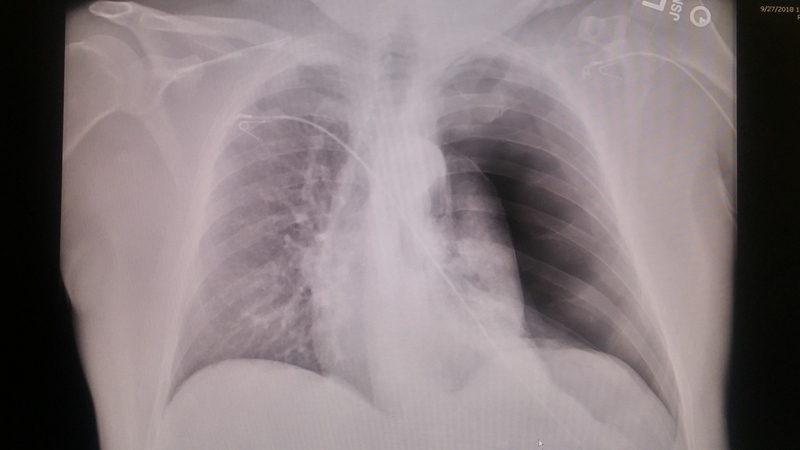 The patient has a medical Hx of pneumothorax X 4, chronic right sided pleurisy, asthma, emphysema, hypertension, GERD with surgical hyatal hernia repair within the past year, duodenal ulcer, scoliosis, chronic low back pain secondary to scoliosis and degenerative disc disease, and chronic anxiety associated with PTSD. Patient was asleep when he was awakened by a sudden onset of chest and middle upper back pain, and profound difficulty breathing. He was taken to the emergency department by POV. On his arrival he told physicians that he had a history of pneumothorax X 4 with no history of surgical repair. On initial contact his heart rate was 160, SaO2 88%, RR 30. As always if you have any questions or comments please drop me a note.